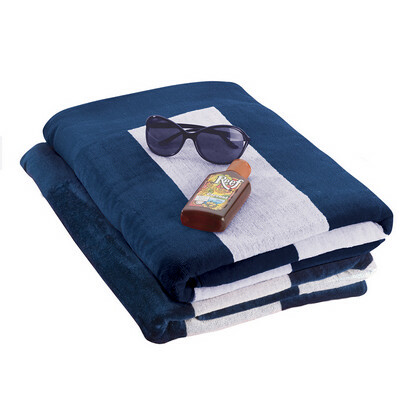 Description: Deluxe blue and white jacquard beach towel made from 100% cotton and 500gsm velour one side and terry towelling on the other. Features: Packaging: Polybag Colour: Blue with White Stripes. Material: Cotton Product Size: 1680mm(h) x 900mm(w) - Panel: 90mm(h) x 900mm(w) Freight details : 20 per carton, 12.90kgs, 45 x 33 x 59cms; Decoration Type(s): Colour Print / Embroider Decoration Area: Screen: 800mm(w) x 65mm(h). ? ?Embroidery: 65mm x 270mm on panel. ? ?Other Methods: Contact your decorator for applicability and size.. Price includes : 1 Colour 1 Position Print. Setup is included.